← Inestead of sewing, I’ll be…My Fair Lazy. I started working again this week. Not a huge deal, part-time to help pay the bills. However, it seems that working agrees with me because I’ve been super-productive! Ok, now that I’ve got that out of my system. I can show you my craftiness from the week. I made a pillow for a friend’s daughter. 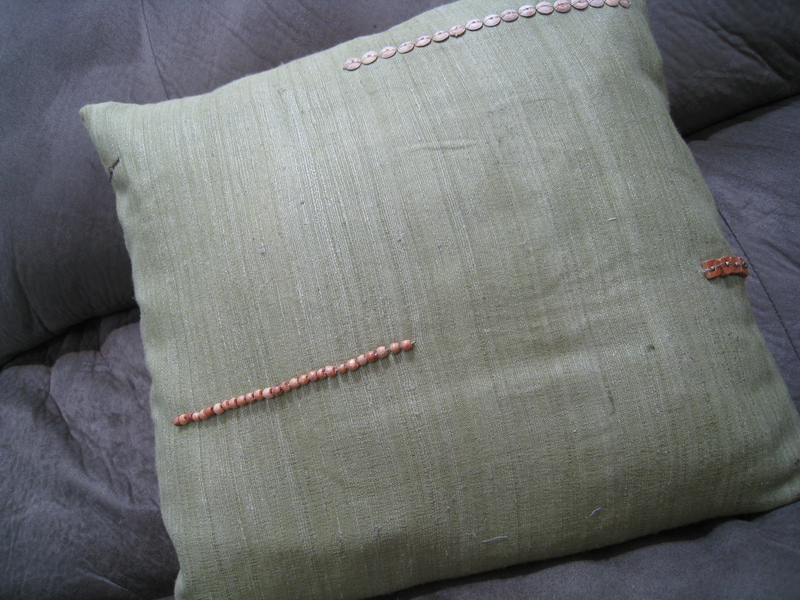 It took me 10 minutes to make the pillow (with a broken needle or two due to my arrogance in thinking that I could sew around those wooden beads) and another 2 hours to fix all the other issues. The fabric stretched so you could see the pillow in the back, so I tried putting snaps on the envelope closure. They pulled, and it was ugly, so I tried using velcro. The velcro showed through so I made a strip of beads to cover it up, while ironing it on I accidentally hit the pillow fabric and it instantly melted. 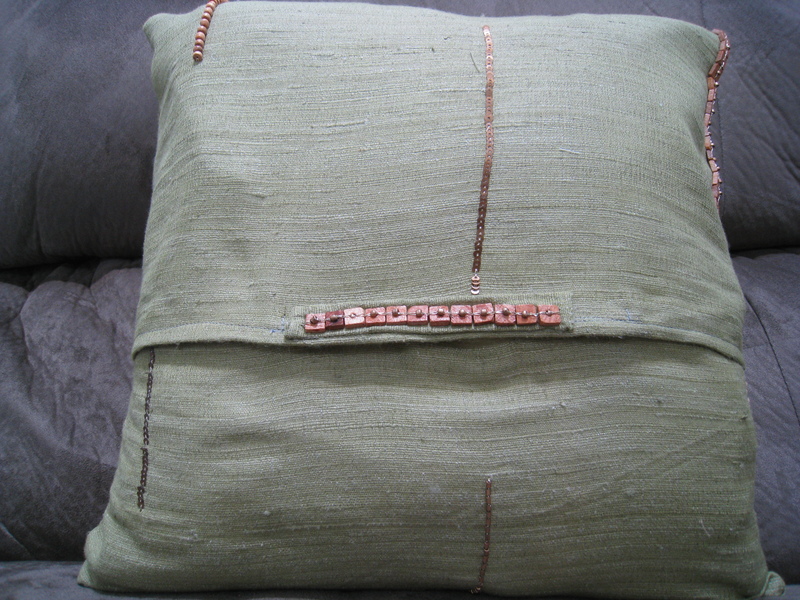 I had to make a new pillow insert (es, ech, eye, tee). 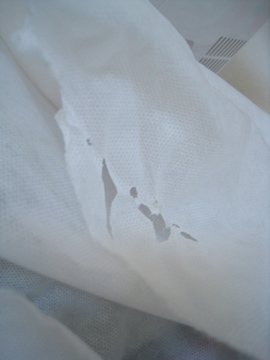 THEN the new pillow was too small so I had to wrap it in batting, but the batting showed through. UGH. 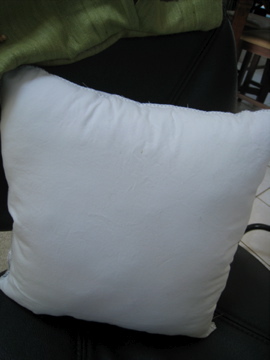 Eventually I got the right ratio of batting to pillow and here’s the finished product. It was delivered last night to yips of glee. Glad you like it. HARUMPH! 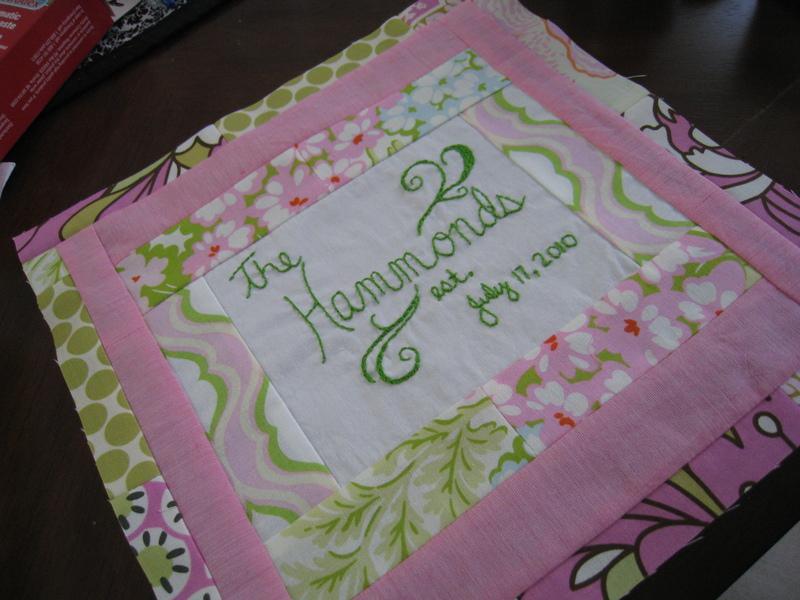 I haven’t been talking about my pink and green quilt much because I have been putting off making the embroidered block for the back. 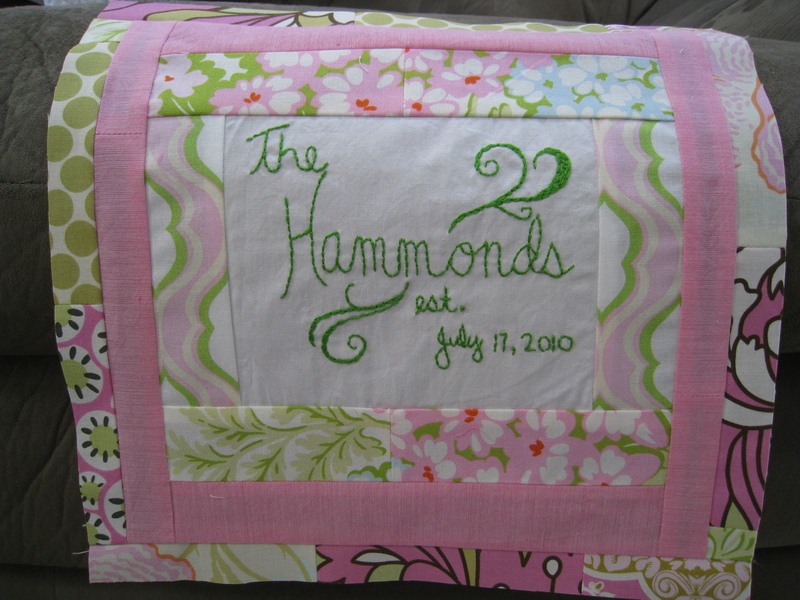 Everyone voted for the patterns they liked the most (overwhelmingly for #3) and then the bride told me she liked #2! ACK! I went with the bride’s choice. I think you’ll be impressed. I’m in love. I want it for me. Luckily for the bride, my name is not Hammond. I am so obsessed with the pink chambray fabric. It is super soft and feels so good! The patchwork piecing is my first “scrappy” endeavor and I really adore the way it came out!! 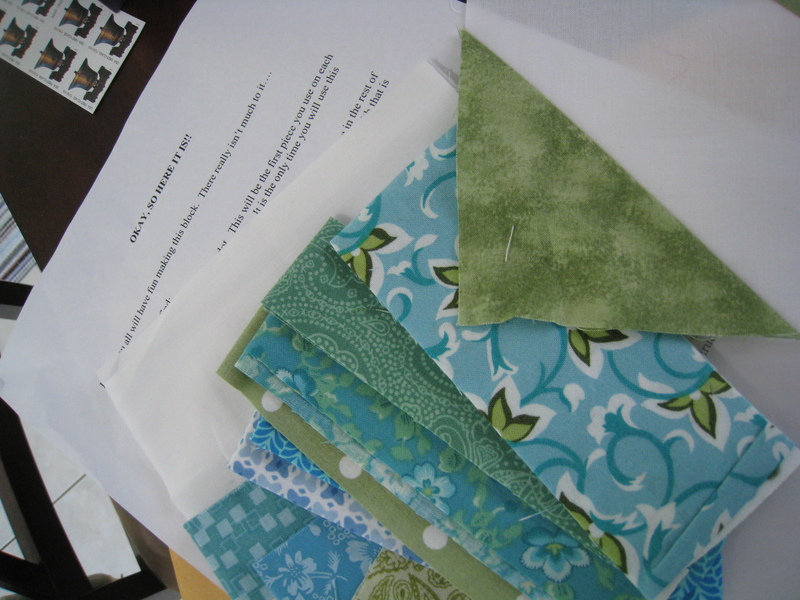 Last but not least…I got my first package in the mail for my very first EVER Virtual Quilting Bee. I’m so excited to work with the wonderful women in the Bee in My Bonnet group! This entry was posted in Bees, embroidery, Finished Projects 2010, General Happiness, string and tagged embroidery, finished projecs 2010, string, VQB, WIP. Bookmark the permalink. Good job on finishing the pillow! If that had happened to me, it would have wound up sitting on a shelf for a month or so. Also, your embroidered block turned out beautifully! Ah ha, so that’s what you’ve up to lately! Good for you for sticking with your pillow endeavor. It turned out quite cool looking! I think your embroidery block looks gorgeous!!! Love the swirls you added above and below their name. I have two block behind with my quilting bee, so I hope to get caught up this weekend.